I can’t believe we are already over half way thru the year and i am only now writing my first post of 2015. Then again, maybe not so surprising… i’ve been a pretty lax blogger over the years. Considering how much i love writing (and talking) about the whole drawing/illustrating process it’s odd that i’m so pokey about posting new thoughts and stories. I guess part of the problem is – i always feel i should be doing something else more work-related. But promoting a new book IS work related isn’t it? 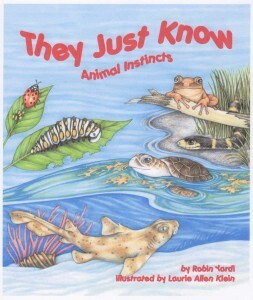 So, to that end, allow me to introduce “They Just Know – Animal Instincts” (written by Robin Yardi, Illustrated by – ME)! Cover of "They Just Know"
As always there are all sorts of fun Behind-the-Art background stories to tell, and the author Robin Yardi asked me all kinds of questions about the illustrations for her blog, The Nonfiction Nook, which i will share, but that will have to come later (but by later i really mean sooner rather than literally a long time from now), this entry is just to introduce the book with a few news-y items and announce some up-coming Book Signings. 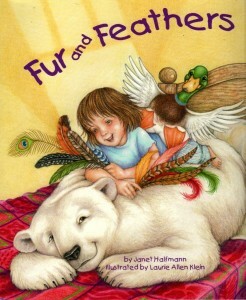 Drawing a line between human and animal behaviors, this debut from Yardi teaches children about instinctual behaviors. Alternating double-page spreads first show anthropomorphized animals “learning” how to do something and then the reality: “spring peepers tadpoles don’t get lessons on leaping at school, and no one has to teach them their iconic song”. A turn of the page reveals: “Mother peepers lay a lot of lovely eggs and hop away. Little tad poles just know what to do, all on their own”. (Sigh) I just love that last part. Anyway, as for the Book Signings (and the main reason i finally got back on the blog) the first one is going to be held this Friday, September 4, 2015, at Simple Gestures (4 White Street, St. Augustine, FL) from 5 to 9. It is the First Friday Art Walk and always a lot of fun but this weekend is also the start of St. Augustine’s 450th Anniversary celebration, with all sorts of events and music and revelry going on downtown, and the Bridge of Lions is going to be closed, so this could either make for a very busy First Friday on “our” side of the bridge, or a real quiet one. Either way – the invitation is extended for you to stop by and hang out with some delightfully crazy folks, look at a some amazing art (and crafts and jewelry and toys and books), not to mention enjoy some wonderful nibblees. There are a couple shops and galleries all right therein the area so it will certainly be worth a visit. 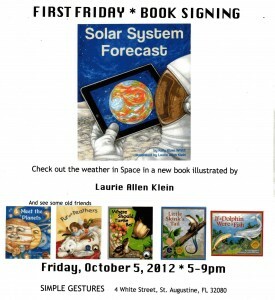 * Saturday, October 3 – I will be at San Marco Books (1971 San Marco, Blvd. Jacksonville, FL) from 10 to 2 (or longer if you want to stay and schmooze). * Saturday, October 24 – I’ll be at on the other side of the St. Augustine bridge at Anastasia Books (81-C King Street) from 11 to 1 (ditto on the schmoozing part). * And then, the Friday right after Thanksgiving – November 27 – i will be at The Starving Artist (28 Cuna Street, St. Augustine, FL) from 11 to 4. Santa Claus is also expected to make an appearance so i JUST KNOW you’ll want to stop by then (children’s books and Santa – what could be better)!! Of course if i pop up anywhere else i will be sure add the dates, but this is a good start. And a nice reason to finally get back to the blog (now if i can only just keep up the momentum). I fully intended to keep up with all my book and art related events but somewhere along the line i stopped posting a calendar (of course i also stopped writing the blog all together and haven’t posted anything since last December so that could have been part of the problem) but i am trying to do better. So before the year completely slips by i thought i’d share the up coming activities. You know… if you’re in the area and want to stop by! I plan to write more about this, in greater detail, but i just wanted to get it on October’s list of events. Marianne and i will also be doing a Book Signing at FRA on Saturday, Oct. 20 (3:45pm) if you want a sneak peek at our program!! 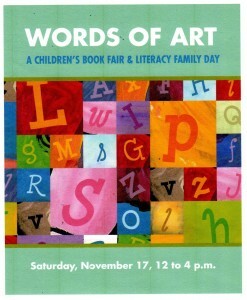 Stop by and talk books and art with us! That’s it for now… but i’ll keep you posted. … To the empty screen and the type. (with apologies to John Masefield’s “Sea-Fever”). But – really – it has been far, far too long since i posted anything. That, of course, was not my intention when i first added a blog to my web site. Back then i was a pretty voracious chronicler of whatever whim and whimsy came my way and wanted to share every thought and observation. But i am also easily distracted by shiny objects – SQUIRREL!!! – and definitely at the mercy of the Creative Writing Muse, who has long been absent. Of course the other (probably bigger) reason i’ve been away from the blog is the fact that i am a technological dinosaur and only know how to do a very few things on the computer. If some new skill is required, or a troubleshooting problem develops, i am at the mercy of the Cyborg, Cylon, Droid, Cybermen, Borg, and Dahlek Powers That Be (who, as those familiar with nefarious artificial intelligence know, tend to enjoy frakking things up – when they aren’t trying to take over the world or enslave humankind). When the Nestene Consciousness takes over, i am out of my league, and wouldn’t you know – my Sonic Screwdriver is in the shop. My particular techno-glitch was being unable to download an illustration to my last post (even tho i had managed to do it quite easily several times before) and i didn’t know what to do or how to fix it. Fortunately my computer savvy daughter happened to be home at the time and made the necessary adjustments. The crops (or, in this case, illustration) was saved and downloaded. But she is not always here. And i was afraid to try again on my own, just in case i couldn’t get art on the page (because what is an art blog after all without art!?!). In my defense i was also pretty busy – finishing the illustrations for my newest book, “Solar System Forecast” (just released this month), that were supposed to be done last December but took until January to complete. Then i had to wrap up all the other projects that were put on hold while i struggled with the solar weather pictures (“Solar System Forecast” is about weather on other planets). And next thing you know, i had another book to illustrate (“Balloon Trees”, about how balloons are made. It comes out in 2013) that took up the Summer, followed by a big rush sea turtle poster project that took up the first couple weeks of September. Nine months passed in a frenzied blur and only recently have i emerged from under the debris, cleared my drawing table, and now suddenly have a renewed interest in writing. And there has been (and still is) soooooo much to write about. I want to explain all the Who’s Who and What’s What in the art of “Meet the Planets” (the blog series i fully expected to start back in January) which, in turn, makes for a lovely segue into the trials and tribulations (and interesting background stories) of illustrating a book about space weather. And after that i would like to describe “Balloon Trees” – hopefully before the thing is published and on the shelves (but i’m not making any promises). I also have several Book Talks, Library Visits, a Book Signing, and a big Presentation (with the terrific author, Marianne Berkes) for the FRA and FAME conferences coming up this Fall that i want to describe. At length. In minute detail. So this is the start. And if my Bluetooth keyboard will stop losing it’s connection to my computer, and the Creative Writing Muse hangs around for a little while, and i can get future illustrations to attach, and i don’t get distracted by – SQUIRREL!!! – just maybe i’ll get some of these stories finished. We can only hope. Fasten your seatbelts – it’s gonna be a bumpy write. It has been far, far too long since i last wrote anything. It certainly has not been from lack of subject matter or interest… i just got busy. Crazy busy! Insanely chained-to-my-drawing-table- every-day busy. Somehow lost the whole summer busy. That busy. Basically i got swallowed up doing the illustrations for the planet book (that will come out Spring 2011 – and will soon be getting it’s own blog series) and that sucked up all my creative energy. By the time i’d finished coloring planets and starry night backgrounds – plus an additional wealth of guest appearance background characters from history, science, math and the arts – all day (every day, for the past 3 months) i had no energy left for thoughtful literary musing, i just wanted to flop in front of the television. Yes, i do that. I’d love to say i went for long, introspective walks along the beach, or sat absorbed in classic literature (those quaint and curious volumes of forgotten lore we’ve all heard so much about), but no… i’d pour myself a glass of wine, pull out the chips ands cheese (or other junk food favorite) and watch repeats of all the alphabet shows: CSI, NCIS, SVU until bed. That was all my poor battered attention span could handle. But all that is now behind me! Well, okay, that’s an over-statement; the planet book illustrations are indeed behind me… but all that other stuff is still very much part of my routine, and i have always had the attention span of a flea – so who am i trying to kid? Let’s just say, now that the planet book illustrations are done, shipped, and going thru the lengthy alchemy of becoming a finished published book it is time to return to the already finished published book that absorbed this blog for so many entries: Fur and Feathers! There are still a few blog chapters left to post describing the illustration journey that was/is F&F, but before i resume that narrative i need to cleanse the mental palate (so to speak) and thought the best, easiest way was to list a few up-coming “Fur and Feathers” Book Signing/Promotional Events (descriptions of which will, undoubtedly, eventually become fodder for additional F&F chapters). So…..
Florida Heritage Book Festival (St. Augustine, FL): Children’s Program at the Flagler College, Ringhaver Student Center. Saturday, Sept. 25. 1 – 2 [NOTE: My program runs from 1 to 2, but i’ll be there all day, signing books and schmoozing at the Nature Nook table]. Micanopy Fall Festival (Micanopy, FL): Book signing at the Nature Nook booth. Saturday, Oct. 30. Time to be announced (but i’ll probably be there most of the day). Ocali Country Days (Ocala, FL): Book signing at the Nature Nook booth. Saturday, Oct. 30. Time to be announced. Right Whale Festival (Jacksonville Beach, FL): Book signing at the Nature Nook booth. Saturday, Nov. 20. Time – again – to be announced. Now let’s see what new stories i can generate!! !